You probably spend hours every day sitting in a chair that is poorly suited for the job. 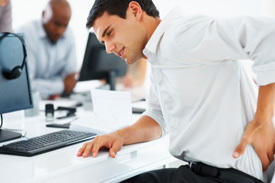 Your posture suffers and soon you begin to feel the effects of strain on your body. So what should you look for in a good office chair? I’m glad you asked! When seated in your chair, your feet should rest flat on the floor or on a footrest. With your back against the back of the chair, your feet should make solid contact with the ground – no dangling! Ideally, your chair will have an auto height adjustment feature, but at least a basic ability to adjust it up and down is fine. You should also be able to adjust the angle of your seat positioned either slightly forward or back depending upon your personal preference. As you are working, your eyes should be level with the top of your monitor. Armrests should be positioned to allow your forearms to rest comfortably while writing or keystroking to take the weight of your arms off your neck and shoulders. This will eliminate unnecessary strain. The front of the chair pan or seat should extend to within one inch of the back of your calf. It should cover most of your thigh for adequate leg support. Lumbar support is essential. Do not go for a chair with a really high back that tends to push your neck forward. That will lead to neck problems and likely some unwanted pain. What’s the Best Chair to Buy? Your best bet is a chair constructed of a lightweight fabric rather than leather. In general, the chair with fabric will be cooler and more supportive. It will also likely be less expensive than the leather alternative. The good news is you don’t need to spend a fortune on a fancy chair to get adequate support. You can usually find a well-made, supportive chair for under $200. I assure you it will make a big difference in how you feel and will be money well spent.